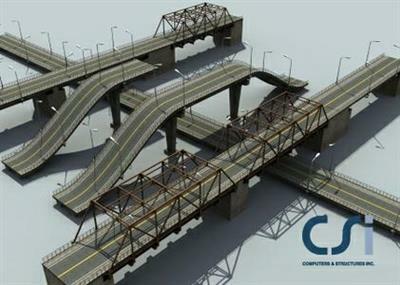 Computers and Structures, Inc. (CSI), a structural and earthquake engineering software company, has released 18.1.1 version of Bridge 2016, is specialized analysis and design software tailored for the engineering of bridge systems. - Loads can graphically be displayed on a model for each stage of a staged construction load case. - All load types in a load case can be graphically displayed in a single view. - New Zealand vehicle library added. - New Zealand material property library added. - New operation added for staged-construction load cases to allow changing link properties. - Event-to-event solution strategy implemented as an option for nonlinear direct-integration time-history analysis. - Automated seismic design extended to consider the bridge capacity in the longitudinal direction.